The How to Sing Harmony app is currently in development, but we need a hand with getting it launched ad-free. We are doing this Kickstarter so that you can help us make it happen! The $25 song sponsorship (with a link or dedications at the end of playback) will be first come first serve, so don’t wait to jump on that! Other rewards are also available in both directions of pledge amount. 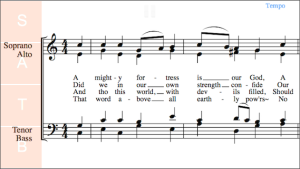 There is a long tradition of singing hymns in four part harmony; it is quickly dying away. Our purpose with this harmony app is to make it fun and easy for people to come and learn how to sing these songs in parts again. It’s actually not a hard skill to develop and with a little effort the tradition can be revitalized before it dies away. But we don’t want to limit this harmony app to religion. National anthems, old folk songs, and other music should be included in this project too (i.e. Jingle Bells, O Canada, etc). And we plan to do this through sponsorships. -An app that can isolate each part (soprano, alto, tenor, and bass) so that people can easily learn a part individually. -Traditional music notation for those who read music. Those who don’t can quickly learn. -Each part will be mutable. The user can implement a variety of methods to master the music. -Adjust the tempo at any time while practicing–even in the middle of a song. -Pause, rewind, and retry a segment you just can’t get. 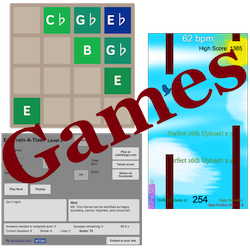 -Efficient programming that uses the same sounds for each song. This will take up as little space on your phone as possible. –Option of vocal synths and/or piano sounds. -75 songs already lined up before sponsorships. -15 free songs (Including Amazing Grace, It Is Well with My Soul, and other popular tunes). Unlocking all songs will be a small, one-time in app purchase. -Available for Android and iPhone. With this harmony app, when people get together to sing songs, whether it be Easter, Christmas, or an event where you sing a national anthem, they will all know their part and sing beautifully. This is a link to the home page for the project. On the right sidebar is a list of the songs that have already been put onto the website. Try learning a song or two and you will see how effortlessly you yourself can learn a part using the embedded videos (even if you’re not a musician). Imagine how useful a tool like this will be as an app! We want this to be ad free. The software we are using requires a $299 fee in order to release apps without the ads. If funded, we’ll be able to release this harmony app without ads, include the most popular songs for free, and include any other public domain songs through the $25 sponsorships. Pledges start at just $1. Thanks so much for supporting this Kickstarter! In percussion technique, a double stroke is two rapid taps in a row from one hand. The double stroke roll is two rapid taps from each hand consecutively, back and forth. This can yield a much faster speed than the single stroke roll, but only when done cleanly and correctly. Two problems have to be overcome. The weaker hand needs to be able to perform a double stroke roll as quickly as the dominant hand. Then, the second tap from each hand needs to sound just as strong as the first tap. While there are some tricks to be learned with sticks, the most important part of the technique is the raw ability to tap like a machine! The second pattern in Rudiment Rock-It develops this skill in a unique and entertaining way. Buddy Rich knew how it’s done! Skip to 1:00 in the video. The game measures the amount of time taken between each tap. It then penalizes inconsistency by making the rocket off course. Going too far off course results in the rocket leaving the screen and the player loses. Also, the amount of displacement differs depending on whether the first or the second tap is being performed. Otherwise only the first tap from each hand would need to be consistent. The game forces the player to be steady all around. 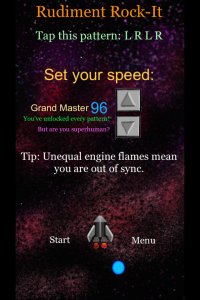 As for the problem of the strength of each tap, the game keeps the player honest by touch screen limitations. If a tap isn’t strong enough it is generally because the stick or hand didn’t come far enough off of the drum to make a good sound. It’s the same when tapping a mobile device. If the player’s hand doesn’t get enough distance from the screen to detect a release, it will not respond the second time. The rocket will quickly begin to go off course. But the player has the opportunity to slow down and regroup before they lose entirely. This is extremely useful for getting overconfident students to slow down and practice correctly! The Single Stroke Roll is deceptive because it’s very easy to learn but takes years to master. Everyone has done it before at some point. A drum roll to prepare for an announcement. Tapping along to a sweet song. Nervously waiting for something. It’s just tapping back and forth. Easy. Until you’re forced to do it evenly and quickly. Us right handers hastily realize how stupid our left hands are, and left handers gloat over their obvious (but not complete) dominance o’re our lesser evolved species. Evelyn Glennie knows how it’s done! Skip to 4:00 in the video. A problem I’ve encountered as a teacher is that students genuinely perceive that they are even and steady. Even with a metronome! And yet the student is obviously executing a perfectly swung 32nd note and just doesn’t know the difference. Rudiment Rock-it will quickly drive this from a student of percussion (or music in general). Any unevenness in tapping each side of the mobile device will be met with losing the game very quickly. The object of the game is to get the rocket to the top of the screen without allowing it to touch the sides of the screen. The game keeps track of the time between the right and left taps. If the time is unequal, the player is penalized by going off course. If the player notices that they are off course, they have the opportunity to slow down and regain control before going off of the screen. They can then make another attempt at playing the single stroke roll quickly and evenly enough to win at the selected difficulty (levels 1-99). Initially, only the first 20 difficulty levels are available. 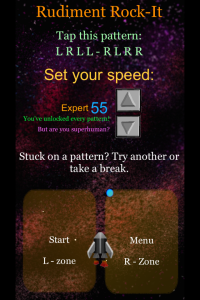 If the player wins, higher difficulties and new patterns are unlocked. 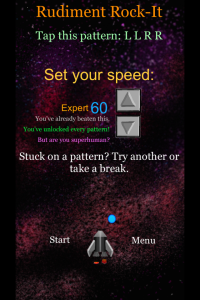 This gives the game a challenge that encourages the player to continue becoming proficient at the selected pattern. There has never been a better way to get a student to practice the single stroke roll!